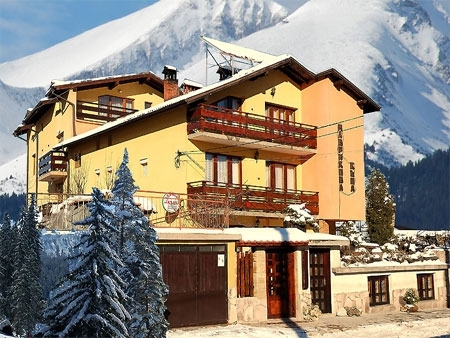 Mavrikova Guest House is just five minutes walk from the center of Bansko. There are available double and triple rooms with own bathroom, TV, minibar and local heating. Promotional prices for the winter season - 15 euro per night(BB)! From the terrace of each room of Mavrikova Guest House is revealed wonderful view to the Pirin mountain. For more convenience , there is a tavern , available only to guests of the house. There can be prepared bansko specialties as kapama, chumlek, sacheta and appetizers. There are also sauna, ski wardrobe, transport, Internet (in each room), reception, parking and more. Mavrikova Guest House is located in close proximity to the city center in a quiet and peaceful street. Suitable for summer and winter holidays, organizing seminars, company parties and family celebrations. If desired, for the guests can be arranged trips to neighboring villages and cultural sites. In sunny summer days, picnics in Pirin Mountain are not to be missed. Enjoy a holiday at the foot of the Pirin mountain!